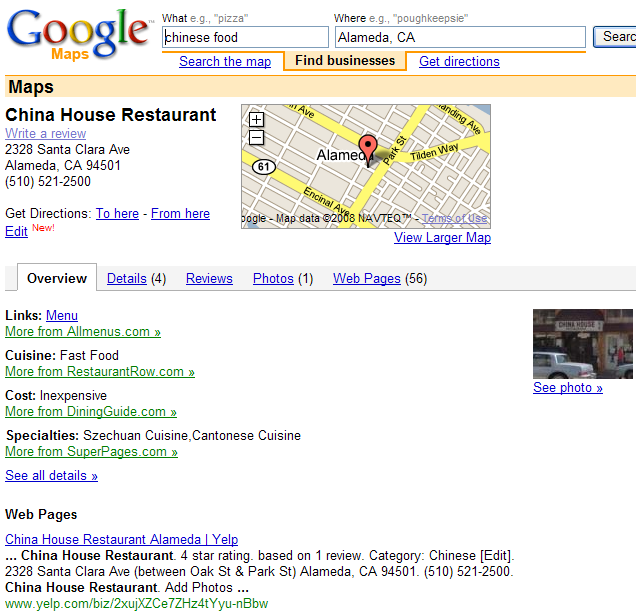 As mentioned on SearchEngineLand, the Google Local onebox may now include up to 10 links in it. The increase from 3 to 10 results was allegedly due to usability testing, but them using text smaller than the rest of the text on the search results doesn't really conform to good usability standards either. While Google is playing catch up maps will remain open and free. Google Video lost to YouTube because of the viral nature of YouTube. And that cost Google $1.65 billion. 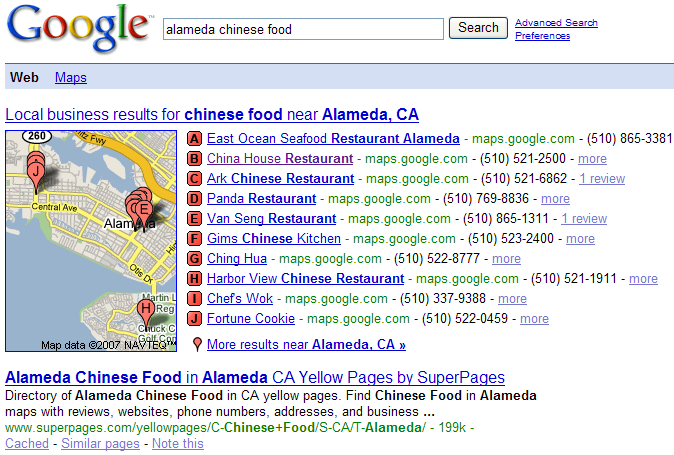 Google will not make the same mistake with maps and local. Most local plays are not viral, and those which have developer platforms limit usage. In a few years Yahoo! will be wishing they begged people to spread that data far and wide to build a leadership position in the market, which is what Google will do via syndication. If Google can drive a lot of traffic to their local listings and start encouraging user reviews that gives them another way to keep users on the Google network and monetize the search results. Interesting post. Google Maps Massups are a viral use of the local data, but its pretty hard to get lots of user content when they make you go out of your way to contribute on the local side. Still showing 3 results in my area... Northern NJ. I searched for pizza paramus, nj. As time passes I think Google's answer to that question is going to be AdWords, AdWords, and AdWords. In the UK we have www.upmystreet.com that deals with a lot of demographic information based on a post (zip) code. It seems to me that the information in the 'find my nearest' directory that is part of UpMyStreet weighs quite heavily in the local results. In truth I'm not sure if this is a coincidence as yet, but there are often a few results that rank high in the local listing that have very little organic ranking ability. Don't know if similar authority sites are used by Google in the US etc to gain similar left of centre results. This smack will really be felt by trusted domains that have been milking geo-listings with little more then directory type results. Properties like 50states.com from marchex that offer little to no original value will simply be bumped by Google. Yup that is another form of arbitrage Google just killed. The sustainable businesses will be the ones with real brands, industry relationships, and leading editorial behind them. Many more thin sites will be replicated by Google and see their profit margins diminish in the years to come. Looks like a mess to me. Looks like a mess to me. Just noticed that for some clients' serps. Fortunately most seemed to get one of those spots. My issue is how they still show these localized results for local queries where proximity doesn't matter a hill of beans - you want someone local, but the guy working out of his garage a 1/2 block from town hall is not more relevant than a 10 person company w/ a corral of 8 figure clients because the query isn't "deliverable" in a physical sense. I am betting that as Google gets more data that when you scroll over these listings user reviews or other details will work their way into the search results. It shows all the 10 links and still font size is ok. Only the problem is that 75% of the page is loaded with map and only 25% of the page contain details which is quite not good because we search in google for concise information in stead of maps. I have local company, and would like to get a placement there. Yet, i cant seem to find place to which i can submit the listing. Pay to Have it done! A great way if you don’t have the know how, nor the time to do it yourself is to pay a firm to have it done. I used Listed1st.com and I’m on top on Google! Search Google for “maid services in salt lake city” Molly Maids to the rescue!